The Sri Lankan banks satisfy many of the key matrices such as growth, profits, efficiency and asset quality against most regional peers but the sector is in deep thirst for fresh capital as the banks brace for full implementation of BASEL III as early as in few months. 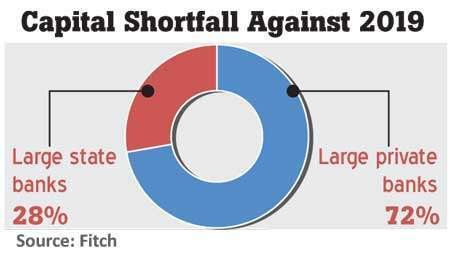 Fitch Ratings estimates the large Sri Lankan banks to have a Rs.19 billion capital shortfall against the higher capital requirements under BASEL III, out of which, the state banks accounting for 72 percent of the shortfall. The Sri Lankan banks are transitioning from the BASEL II to BASEL III regime and the latter calling for higher capital ratios, including the additional capital buffers for systematically important banks or banks with assets over Rs.500 billion. The BASEL III capital requirements include a capital conservation buffer of 2.5 percent and a capital surcharge for domestic systemically important banks or D-SIBs of 1.5 percent. Under the new BASEL III regime, the new minimum Tier I and total capital ratios have to be increased to at least 8.5 percent and 12.5 percent, respectively, from 5 percent and 10 percent under BASEL II. The BASEL III regime, which came into partial effect from July last year, gave banks—both systematically important and non-systematically important—a staggered implementation time frame till the new regime comes into full effect in January 2019. 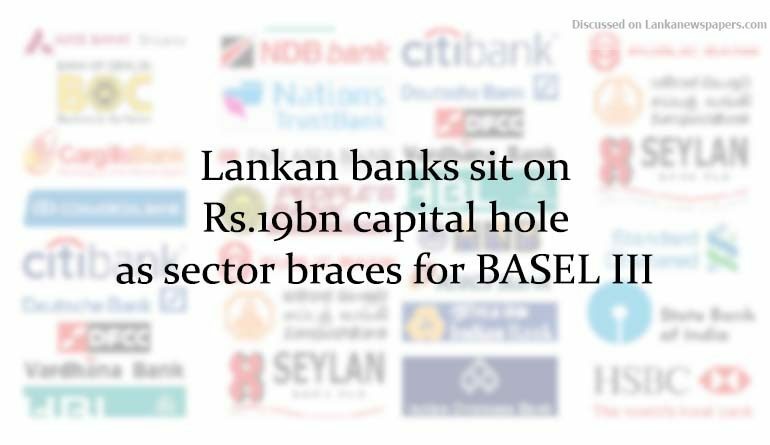 “Fitch estimates the large Sri Lankan banks will have a Rs.19 billion capital shortfall against the BASEL III requirements based on bank-specific assumptions, with the state banks accounting for 72 percent of the shortfall,” Fitch Ratings said in a special report, yesterday. Fitch however said the capital shortfall has not factored in the impact from the new International Financial Reporting Standard (IFRS) 9 on finance instruments. The local banks were seen disclosing an estimated impact on capital ratios from the implementation of IFRS 9 from January 2018. However, Fitch believes the IFRS 9 impact on the banks’ regulatory capital ratios could be spread across several years. Large Sri Lankan banks raised Rs.42 billion in equity and Rs.11 billion in the BASEL III-compliant Tier II capital in 2017. Commercial Bank, Hatton National Bank and Sampath Bank have raised equity capital of Rs.10.1 billion, Rs.14.2 billion and Rs.20.1 billion, respectively. They separately raised Tier II capital via convertible subordinated debentures. Meanwhile, People’s Bank and Bank of Ceylon received Rs.5.0 billion each from the state coffers. Fitch said that the state banks’ capital levels are vulnerable to dividend demands from the state while their ability to raise capital is in certain instances also constrained by the limitations placed on them through the respective acts that govern their establishment. Meanwhile, state-owned Bank of Ceylon has proposed a new Tier II issue. Fitch generally rates the BASEL III Tier II debt one notch below the anchor rating, where the anchor rating for an issue is the bank’s stand-alone strength but in the case of Bank of Ceylon, Fitch has assigned the ‘AA’ rating due its extraordinary sovereign support. “Fitch believes there is a case for factoring in extraordinary sovereign support into the anchor ratings of the BASEL III Tier II instruments for some select banks with strong state linkages and systemic importance as the state is likely to have a strong interest in supporting the instruments of these banks before loss absorption features are triggered,” the rating agency said.